With a wingspan of between 3.5-4 inches (8.9-10.1 cm) luna moths are the largest moths in North America. They are pale green moths that have four eye spots - one on each of their four wings. Their bodies are furry and white. Luna moths are nocturnal and so they aren't as commonly encountered as butterflies or the few diurnal moths (e.g., hummingbird moths, giant texas flag moth, decorated beauty). 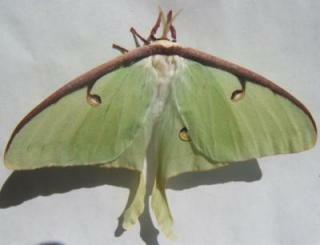 However, when luna moths are encountered they are hard to miss because of their large size. Adult luna moths only live for about seven days. One interesting characteristic of these moths is that the adult moths don't feed. In fact, they don't even have mouths. Unfortunately, they usually die shortly after mating and/or laying eggs. Female luna moths can lay a few hundred brownish colored eggs. They usually lay their eggs on the leaves of one of their larval stage host plants: persimmon, sweetgum, walnut, and hickory. The eggs hatch in about a week and a half and the small caterpillars begin eating the leaves of the host plant. Luna moth caterpillars are green. When they first hatch the caterpillars are very tiny. As they feed on the leaves of their host plant, they grow and molt five times in stages called instars. At the end of the fifth instar they form brownish paper-like cocoons. The moth overwinters in the cocoon and emerges as an adult moth in the spring. When the moth first emerges from its cocoon, its wings are shriveled and wet. The moth pumps fluid into its wings to expand them and then rests until its wings are dry. Once its wings are dry the adult luna moth goes in search of a mate. The adult female luna moth releases a pheromone to attract a male. 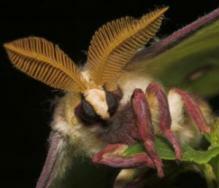 The antennae of the male luna moth is larger than the female's, which enables him to find the female. They mate and then the luna moth life cycle begins again. Copyright © 2008-2018 ButterfliesSite.com. All rights reserved. Image of female luna moth (top image © Shawn Hanrahan from Wikimedia Commons Image of luna moth eggs © Shawn Hanrahan from Wikimedia Commons Image of 1st instar luna moth caterpillars © Shawn Hanrahan from Wikimedia Commons Image of luna moth cocoons © Shawn Hanrahan from Wikimedia Commons. All four above images licensed under the Creative Commons Attribution ShareAlike license versions 2.5. All other photos are from istockphoto.com and may not be copied.